Signs of aging usually appear on the face and neck first before the rest of the body in the forms of wrinkles, skin laxity, and hyperpigmentation (spots). 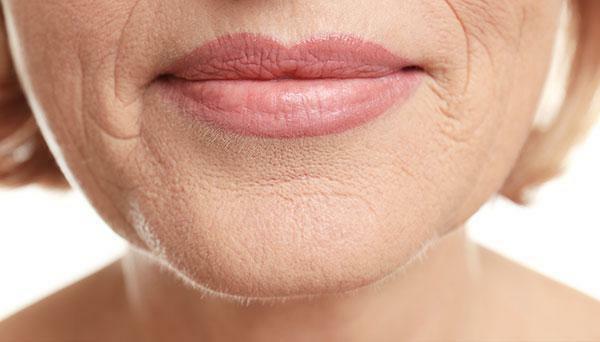 Wrinkles: Wrinkles form for a couple of reasons on the face and neck. The first is a loss of skin elasticity, which is a result of the natural reduction of collagen production and elastin in skin during the aging process.The second is because of repeated muscle movements, which, over time cause the skin to create permanent depressions in the skin (an expression line). The most common areas these expression lines are seen are on the sides of the eyes (crow’s feet), forehead, vertical lines in between the eyebrows, and around the mouth. Skin Laxity: With a loss of the skin’s natural elastin and collagen, along with gravity and repeated muscle contractions, aging skin will tend to start to become more lax, eventually giving a “sagging” experience. This is mainly seen as jowls, loose skin on the neck, and heavier, sagging eyelids. Hyperpigmentation (spots): A common giveaway to age is the presence of hyperpigmentation (spots) on the face. Hyperpigmentation is caused by sun exposure, genetic reasons, or other health or hormonal causes. With anti-aging being of concern to men and women of all ages, Los Gatos Dermatology provides several options for patients depending on the skin concern and individual patient. At Los Gatos Dermatology, we specialize in providing unique and individualized treatment plans that are designed with your specific needs and desires. Make an appointment with us for a consultation to discuss your skincare goals and come up with a plan that works for you! Kybella®: KYBELLA® is the only FDA-approved injectable treatment that destroys fat cells under the chin to improve your profile.